Famous people born AUGUST 22 belong to the zodiac sign Leo. You are someone who is able to give their time to make sure other people are taken care of. They’d make a steadfast employee or leader. On a personal and on a work level, they understand people and can sympathize with their associates, friends and family when they come to them for a listening ear or a shoulder to cry on. A position in social services would suit them best. Famous celebrities born on August 22 have a real talent for discovering what’s on the inside of people and bringing out the best in them. Not everyone can do this, they know so, consider this as a gift from the gods. There are times when they can’t be your normal pleasant self and they are capricious. However, they love it when people return their devotion. People are naturally drawn to them as they are extremely humble but captivating people. Normally, they are self-determining and free individuals. 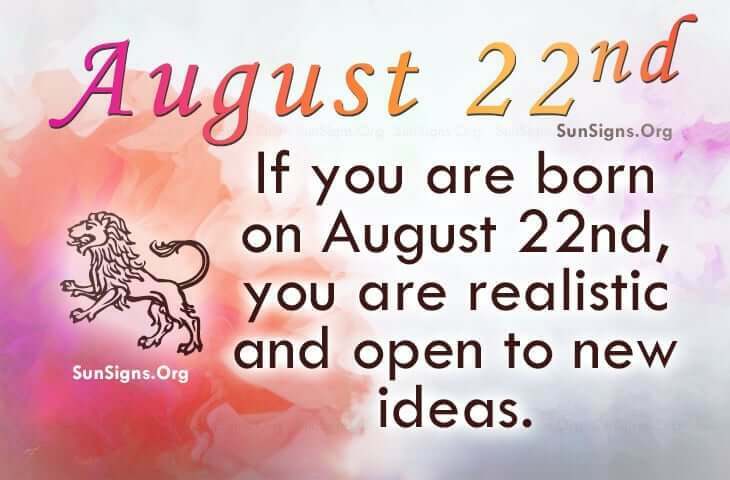 Famous people born on AUGUST 22nd are Leos who are concerned with other people and how they feel. They are however, opinionated and intolerant. Unpredictable, they have the ability to charm others. It’s part of their mysterious appeal. They are open to new ideas.